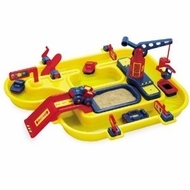 A must-have for every aspiring child industrialist, this playset features a one-piece waterway with a snap-on "Wave Maker" device to propel the four barge-like boats. At 9.25" tall, the 360-degree rotating crane services both the waterway and the sand pit. Set also includes a flatbed truck designed to hold the cargo units. Three stop gates control the flow of boat traffic. Measures 19" x 17" x 9.25". 19" x 17 1/4" x 8 7/8"